Note: Since publishing this post, I’ve learned that our feathered visitor is a House Finch not a House Wren. I’ve made changes accordingly. As I walked up the garden path this morning I noticed a house finch sitting on the ground. Mouse the cat was just a few yards away so I had to think fast. I waited for the bird to take flight. Instead he fluffed his feathers and bobbed his head, but made no effort to move. In a flash, Mouse shot through the bushes, aiming straight for the bird. 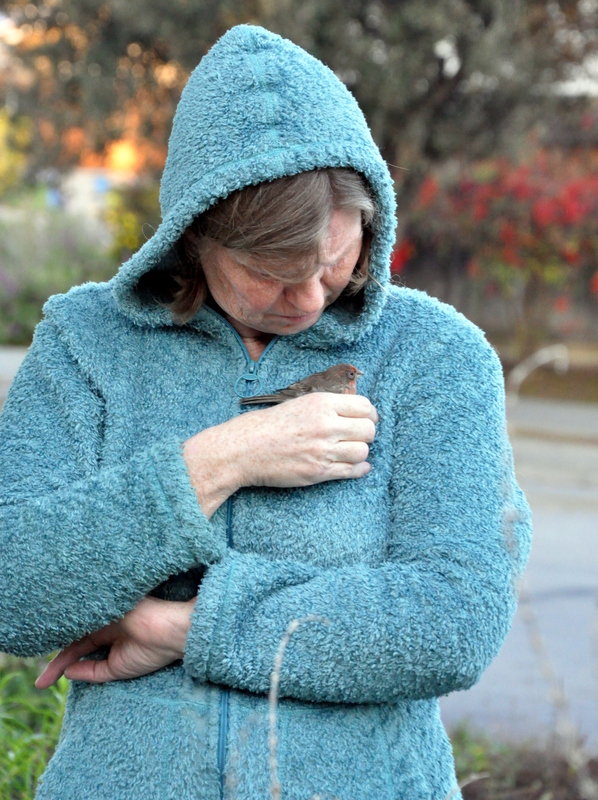 In one fell swoop I scooped the bird in to my hands and lifted him off the ground to safety. 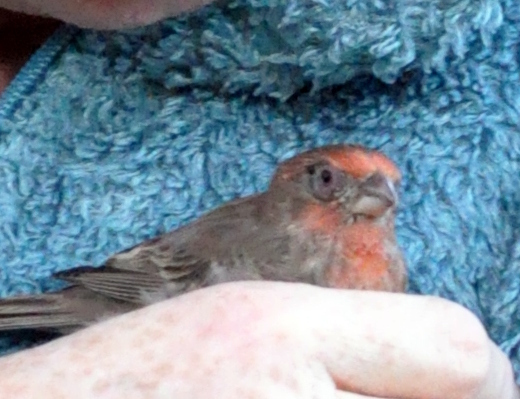 I loosely cradled the finch in my hands, its soft wings fluttering against my skin. The next five minutes are a bit of a blur, but I somehow managed to get Mike’s attention through the kitchen window and he came to assist. He secured the cat, assembled a cardboard box from the recycle bin and even managed a few pics from a safe distance. I opened my hands to see if the bird would fly. He climbed on my finger and calmly perched to survey his surroundings. It was then I noticed that he couldn’t open one of his eyes. It didn’t look damaged, but it may have been what grounded him in the first place. He eventually hopped from my hands to a low bush but leaving him there would mean certain death. I caged the little fellow in a cat carrier (oh the irony) and drove to the Wildlife Center of Silicon Valley. How lucky we are to have a place like this that will rescue, rehab and return animals and birds to the wild whenever possible. Later in the day when I had time to think I wondered if the injured finch might be my nightly visitor. Over the past thirty days, a male house finch returns at dusk and spends the night on the cord under the eaves. I lingered outside till 5:20 willing my nightly visitor to return. I came inside with a heavy heart assuming the two finches were one and the same. Then moments later, I glanced out the kitchen window into the dark corner of the eaves and spotted his tail feathers under the eaves! I’ll learn tomorrow the fate of the bird in the care of WCSV. 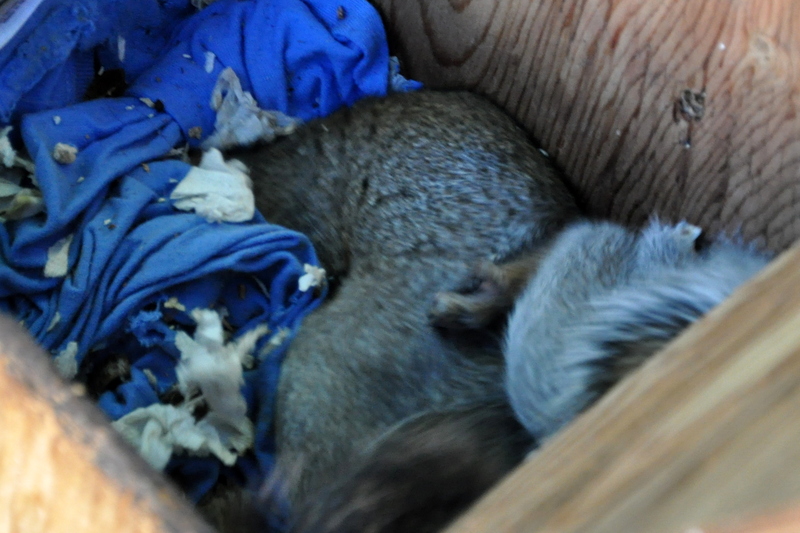 Three of the six baby squirrels, September 2, 2014 Photo courtesy of Jessica B. 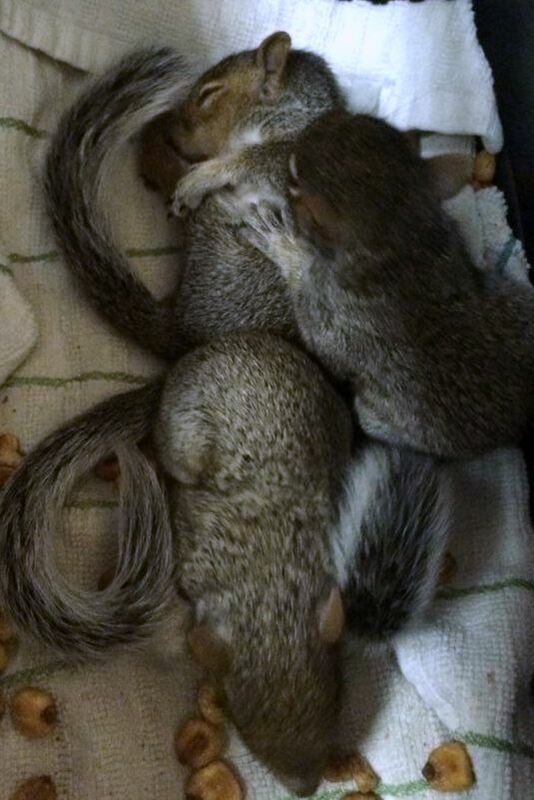 A few months ago my friend Jessica rescued half a dozen baby squirrels. Two young boys in her neighborhood found them on the ground and brought them to her for help. 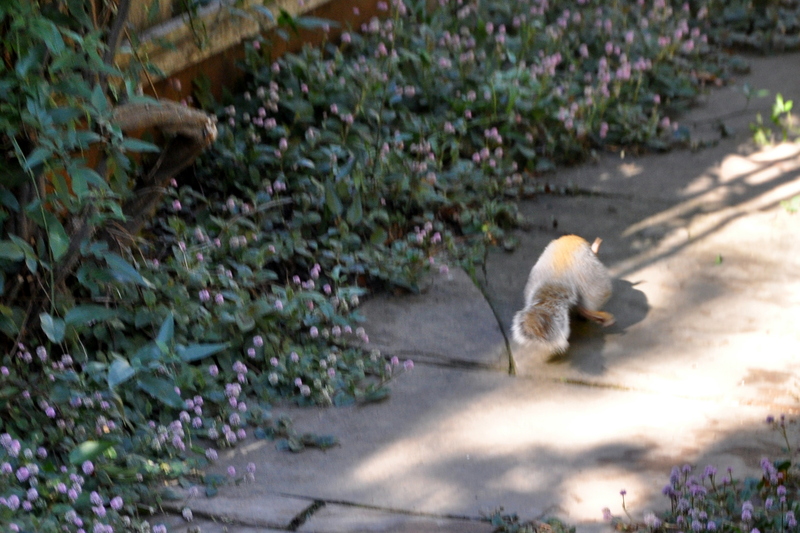 The squirrels were small, eyes still closed, and unable to survive in the wild on their own. Jess contacted a rescue group who took them in, but they needed a place to release them once they were old enough to be on their own. Guess whose arm shot up in the air? Pick me, PICK ME. I called Connie who works with a few other home-based volunteers the following day. 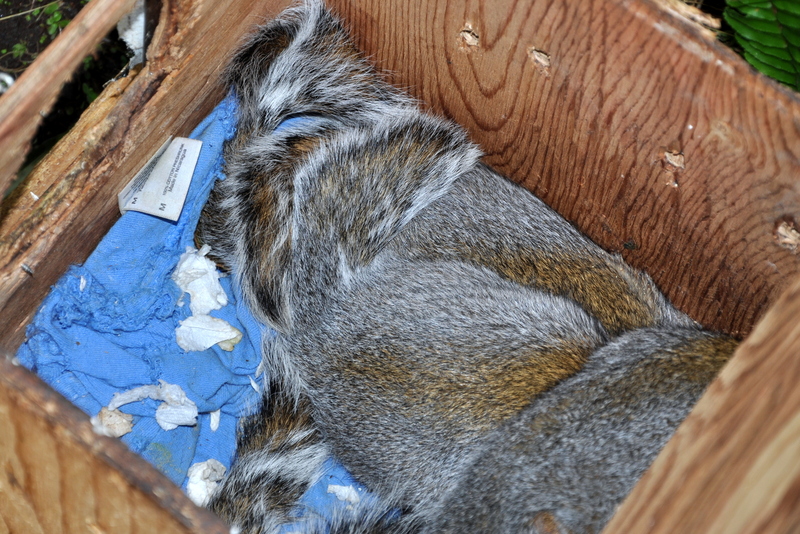 The rescue group, Injured and Orphaned Wildlife, said it would be a few months before the squirrels were ready. They would be in touch when the babies could survive on their own. They want to re-release the squirrels into neighborhoods with established squirrel populations. We definitely qualify. Last night I got the call. The volunteer asked if she could release them in our garden this morning? Ann arrived around 10:30 with five young squirrels in tow. 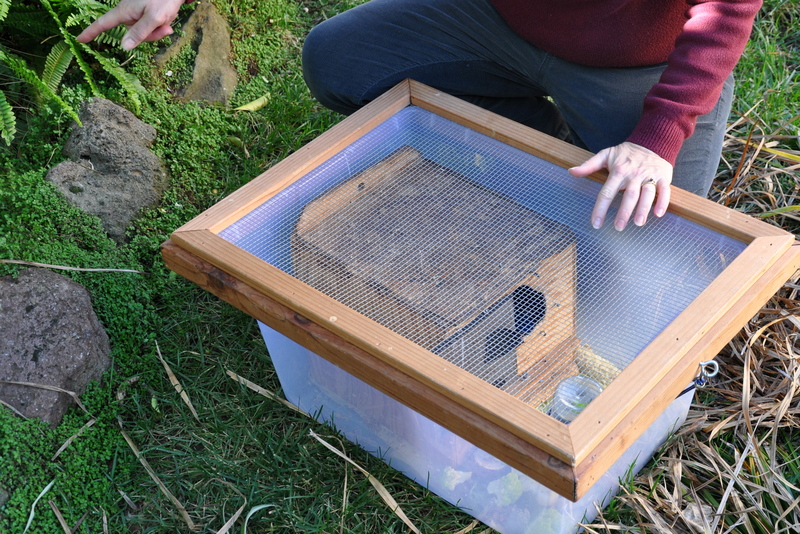 They traveled in a wooden nesting box, encased in a larger plastic crate ready to move in to Gardening Nirvana. 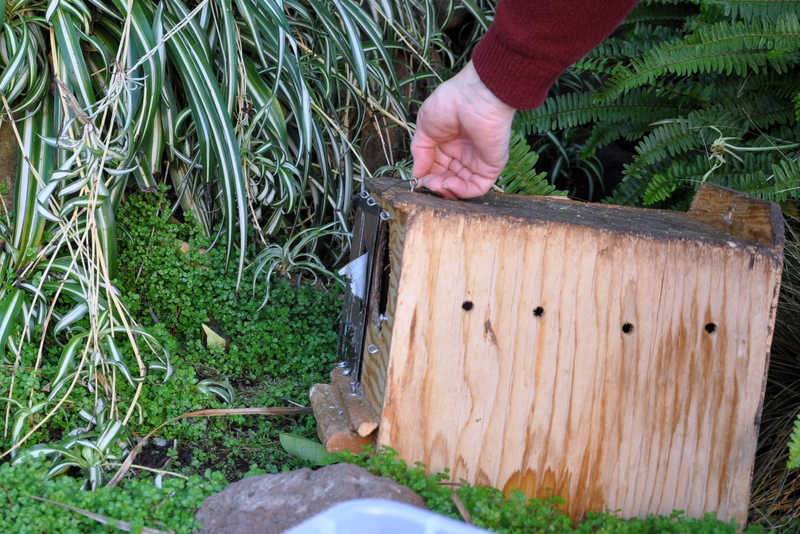 She placed their nesting box under our orange tree and scattered handfuls of fruits and vegetables nearby. After lifting the top of the wooden nest, we stood back and waited. They remained huddled together, poor little things, breathing heavily and trying to burrow to the bottom of their cozy box. Ann said that once one of squirrels leaves the box, the others usually follow. In our case, two of them shot out within seconds of each other, and raced to the safety of nearby shrubs. The remaining three hunkered down. I watched for half an hour, but reluctantly had to leave for appointments. Ann asked me to call her if they were still in the box at nightfall. 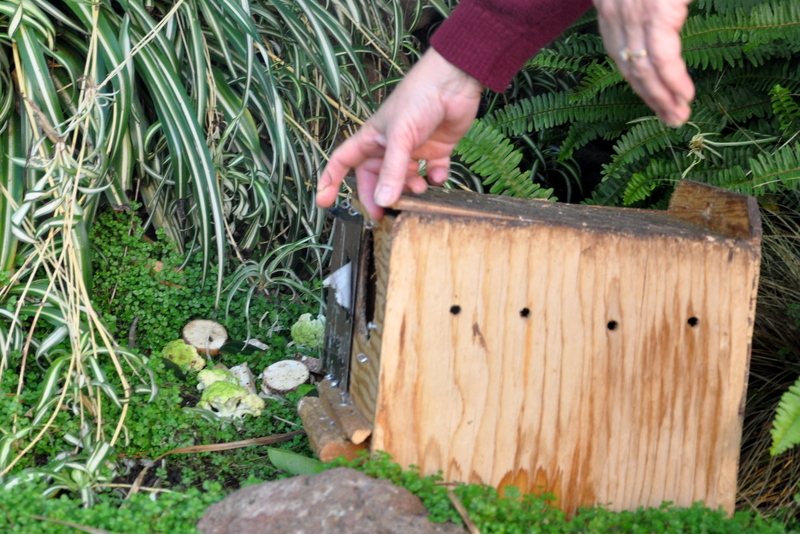 If so, she would return and secure the nesting box to a tree. By mid-afternoon, they had vacated the box. We’ve watched from inside as they explore the garden. What joy! I’m grateful for all the caring hearts that brought this to fruition: the two young boys who knew the tiny squirrels needed help, and my friend Jess for taking them in and contacting a rescue group. Special thanks to Connie who takes in these rescues and Ann who delivered the nesting box, with the care and wisdom of someone that’s rescued critters for over 30 years.